We have recently become aware of certain new NON IPAF contracts and invitations to join “new” versions of old networks, which warrant most urgent warnings from IPAF. IPAF may not tell members whether to sign a specific scheme contract or not, but we can advise members on the terms contained in any contract and the consequences of agreeing to wording which is unapproved by IPAF. Members are, of course, ultimately free to sign or not to sign any scheme contract of their choice. 1. Please enquire whether IPAF has been involved at all with the compilation or administration of the contract. IPAF does not negotiate on fees, however, with IPAF approved contracts we will ensure that procedural and operational fairness is built into the documentation, together with your right to have peer review performed by similarly qualified peers, who you can identify with, trust and discuss your problems with. Not clerks sitting behind computers and working off drop down menus. 2. IPAF will never endorse a contract allowing the funder or administrator the right to terminate the agreement without any recourse to the provider and/or the provider’s representatives. 3. 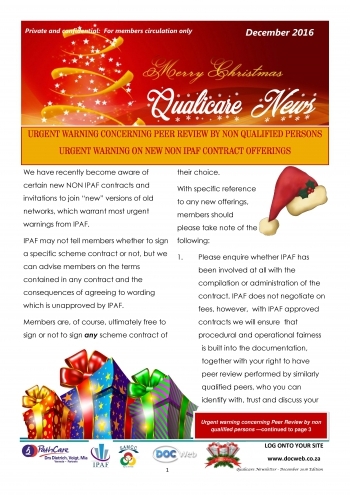 IPAF will never permit the funder or administrator to automatically utilise the provider’s practice as a marketing tool for the scheme options, both on the funder/administrator’s website/s and in the provider’s rooms. 4. It is the Provider’s responsibility to verify patients’ membership and available benefits. You are however advised NOT to accept patient’s membership cards which are not familiar to you for a first consultation, except in emergency situations. - it is the Provider’s responsibility to refer only to “ in network” specialist, hospitals and pharmacies. - providers must keep practice hours from 9h00-17h00 Monday to Friday and on Saturday from 9h00-12h00 in order to retain the contract. The most important issue to consider though is the attitude to Peer review as these contracts intend to subject you to peer review by non-doctor clerks. Peer review by anyone other than a similarly qualified professional, is irregular in the eyes of the HPCSA, is an insult to the Medical profession and should be responded to with disdain and avoidance. How can non-medical personnel try to discuss your claims treatment patterns and patient profiles with you in a meaningful manner, with a view to addressing your level of servicing, (over or underservicing) and clinical compliance? Even more disturbing is that these clerks are on the payroll of the administrators, and could be incentivised, without due regard to the patients’ welfare. Remember too that you should never undertake to make available files and records of patients for whom services have been rendered without express permission from the patient and an application via the Promotion of Access to Information Act. “The introduction of managed care programmes will increase the responsibility of the Health Professions Council of South Africa (HPCSA) with regard to the protection of the public interest and in guarding professional and clinical standards. (iv) Scheme protocols should be harmonised with the ethical dispensation of the HPCSA. Access to confidential health care information about a patient by a third party requires the informed consent of a patient, his/her parent/guardian, executor of the estate/next-of-kin or curator as required by law. One should guard against the rights of individuals being eroded by the possibility of payment being withheld on the basis of non-disclosure. Blanket permission for disclosure by the member on behalf of dependants is questionable. The Medical Schemes Act currently only requires schemes to take “reasonable” steps to protect confidentiality – this is considered to be inadequate protection for patients. The medical protocols, clinical guidelines and review criteria used by medical schemes and managed care organisations must be developed by doctors according to scientific criteria. These guidelines should not be dictated or influenced by managers of HMO organisations whose primary objective is cost-saving. behaviour for the benefit of the patient. It would not be permissible to enter into contracts that transgress the Ethical Rules or affect the clinical independence and judgement of practitioners. Members are thus advised and implored, to make a true informed decision before signing any medical scheme/administrator/insurance and/or managed care contract.